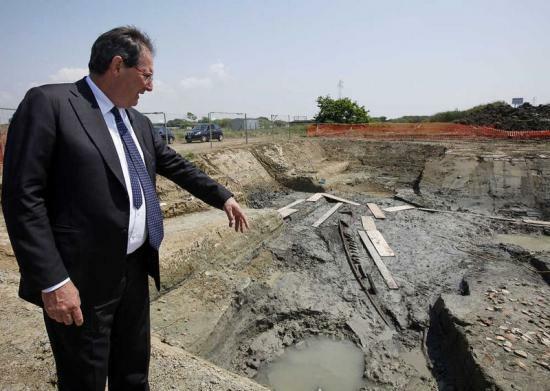 A 2,000-year-old Roman ship in the middle of a plain near the ancient port of Rome has been unearthed by Italian archaeologists. The wooden vessel was found at a depth of 13 feet during repair work on a bridge that links the modern town of Ostia with Fiumicino, where Rome's main airport is located. Measuring 36 feet in length, the ship is the largest ever excavated near the ruins of Ostia Antica, a port city near the mouth of the Tiber River that rivals the riches of Pompeii. So far, only the right side of the ship is visible. Remains of ropes, used by the ancient Roman sailors, are beginning to emerge. “The bow and stern are still missing. From the way the ship is built, we can date it to the first imperial age,” Anna Maria Moretti, archaeological superintendent for Rome and Ostia, said. A thick layer of clay has basically sealed the vessel, leaving the wood intact. Described as "spine-tingling" by culture minister Giancarlo Galan, the discovery shows that when the ship sailed the Mediterranean, the coastline was some 2-2.5 miles farther inland than it is now. Several Roman ships, now housed in a museum at Ostia, were discovered during the construction of the Fiumicino Airport in the 1950s. But experts believe that the newly found ship is much more important. “It’s a unique find. At that depth, we have never found a ship," Moretti said. The ship’s large size suggests that it might not be an isolated find. More vessels might be buried in the area, possibly indicating the exact location where the Roman empire's biggest fleet was stationed. Indeed, Ostia is just 1.2 miles away from Portus, a monumental seaport now reduced to a large hexagonal pond on a marshy land. Begun by the emperor Claudius in 42 A.D., inaugurated by Nero and greatly enlarged by Trajan in the 2nd century, the harbor fed a city of more than one million down into the Byzantine period and beyond. 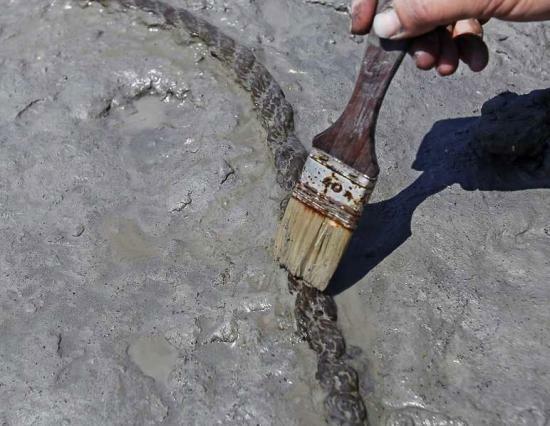 In addition to Ostia and Portus, “the archaeologists believe that a third seaport might have existed in the area,” wrote the daily Il Corriere della Sera. As the excavation continues, the archaeologists are keeping the ship constantly covered in water in order to preserve the wood. “We must prevent the wood from drying out. Restoring the ship will be an extremely delicate task,” Moretti said.